You know the film JAWS? Of course you do, it was that film which made it impossible for a lot of people to ever go swimming in the ocean again, unless you’re a daredevil surfer with a death wish. Well, that’s how we would describe surfers on the Southern California coast line of late, as this recent news report proves from the sunshine state. A sheriff’s helicopter was brought in to warn a group of paddle board surfers to get out of the ocean at Dana Point southern Orange County, as they had spotted over a dozen Great White Sharks in the vicinity, 25 Great Whites in total to be exact. The helicopter called out for the paddle boarders to make it swiftly and silently over to the shoreline to beckoning safety. The Orange County Sheriff’s Department announced via loudspeaker from the air, “You are paddle-boarding next to approximately 15 great white sharks,” said Deputy Brian Stockbridge to people in the ocean. Yikes, this is why we only indulge in safe extremes, because there’s nothing more frightening than to be surrounded by 15 Mother Jaws, is there? Imagine the suspense, as the dark murky depths beneath you hide the world’s most dangerous fish, ready to snap you in half because they mistook you for a seal or sea lion Yum, yum, yum, mashed it up! And, now you’re split in two and what to do? But, just bleed out and die. Luckily, there were no bites this time, but you have to wonder a little bit about these surfers that wish to play Russian Roulette with the oceans, as you’re only one attack away from sudden death. So, with that in mind, let’s show you why you should stay on the beach and definitely not drift out into the murky deep waters off the California coast. Yes, that could be your legs inside those Jaws, with only a surfboard to cling onto, sounds like fun doesn’t it? NOT! Yes, that seal could be you flying off your surfboard as you get hit by a 1,000 kilograms Shark that’s shooting up from beneath you. You’d be nothing more than a light lunch appetizer for these monstrous killers and we bet that you’d be going home in a hearse and not in an ambulance. Who’s going to pick up all the pieces? You could just be minding your own business on your surfboard, then just a quick look over your shoulder, reveals this! What would you do? Oh no, don’t worry, these fish don’t bite, see? They’re only like the friendly dogs of the ocean and they only eat you by mistake, right? Go ahead, pet it’s nose. Forget about the spiders for now. Now, let’s say hello to Gary the Great White, he’ll always be behind you, ready to re-arrange your physical form, should you slip off the board that is! Are you sure about that? 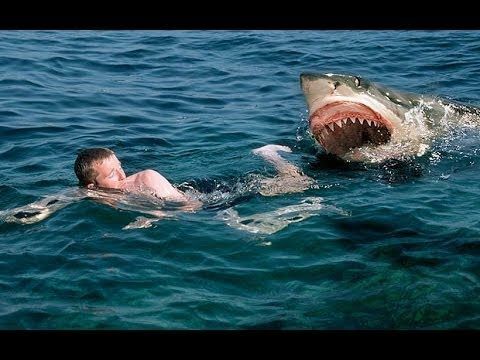 You don’t need to be a rocket scientist to know that one day it might happen to you, by being out there surfing in the Oceans, since you’re now more susceptible to a Jaws attack than ever before, even if people claim that you’re more likely to hit the lottery. Do you like these sorts of risky games? Even shark scientists like Richard Dreyfuss (Ha!) knew what a beast like this could do to you, and Roy Scheider was clearly shaken by Spielberg’s Coca Cola can shark decoy too, so just imagine the real thing? Here it is! This could be you! Haters will say it’s photoshopped! Anyway, let’s finish off now with a video that was once considered to be real, but then questioned over its authenticity, but why don’t you judge for yourself, as this man goes in the ocean with his GO-PRO camera. Now that we have ruined your aspirations to get into the ocean this summer, you can thank us ahead of time, by helping you to spare your precious limbs from a Great White Shark attack. Remember the ocean isn’t made for man, but instead it’s made for big fish! Get it?